As I am FINALLY beginning medical school in a few weeks down in Puerto Rico, I am looking to sell my Dell Arte Blues Claire model guitar to free up some funds so that I am able to ship my car to Puerto Rico. I do have another gypsy guitar, and that will hold me over until I have the M.D. after my name, and can afford another top shelf gypsy guitar. It's basically an hommage model with a custom white finish and nickel silver hardware. 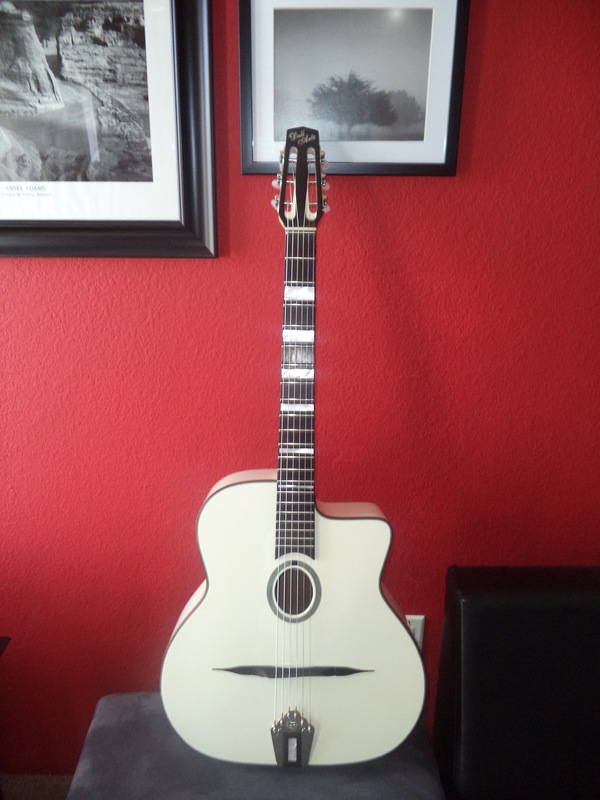 I have owned and played the guitar for 6 years, and it is the best sounding, best playing gypsy jazz guitar I have ever played. There are no dings in the guitar whatsoever, only a light haze by the sound hole from all these years of playing. The guitar is one of a kind and is going to be a great player for anyone that buys it. It was just refretted by John Kinnard himself last year, so the frets still have plenty of life in them. I am asking $2500 for the guitar. Do not give up your gypsy jazz guitar for medical school. That would be a mistake. You will still have time to practice and you will need to have some time to unwind from your studies. Medical school is about balancing your life. You will do well if you can balance the time you spend drinking from the firehose of knowledge with time spent releasing stress. There is no better way to unwind than to play music. Thank you for your kinds words! I think I may have overreacted about being able to play guitar. I do have another gypsy guitar that I will be able to play, but needed the money from the sale of this instrument to ship my car down to Puerto Rico. I have never have had the opportunity to just study; as I have always maintained full time employment whilst studying full time. That being said, I am sure I will have time for guitar, in addition to my studies.